‘On the Balcony’ (阳台上) is an upcoming Chinese romantic drama directed by Zhang Meng. 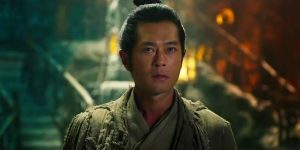 ‘Kung Fu Monster’ (武林怪兽) is an upcoming Hong Kong-Chinese wuxia fantasy directed by Andrew Lau. Well Go USA are bringing Yuen Woo-Ping’s ‘The Thousand Faces of Dunjia’ to Digital, Blu-ray and DVD on March 27, 2018. Cheng Cheng Films will release the Chinese romantic drama ‘Soul Mate’ (七月与安生) on VOD from February 5, 2018. ‘The Thousand Faces of Dunjia’ (奇門遁甲) is a Chinese fantasy-wuxia film written and directed by Yuen Woo-Ping.